Our Five Minute Meals Vegetarian Gift Box contains everything they'll need to create some fabulous quick and easy Italian meals including Spaghetti aglio, olio, peperoncino (with garlic & chilli oil), Penne with truffle sauce, Fusilli with tomato & sweet Tropea onion sauce, Risotto with truffle, Risotto with porcini mushrooms and many more combinations! Bronze Die Cut Gragnano Spaghetti (500g) Our IGP (Protected Geographic Denomination) spaghetti comes from the home of pasta, Gragnano near Naples. It is a great quality product which retains its shape when cooked and tastes great. Bronze Die Cut Penne Pasta (500g) One of the most popular pasta shapes, penne are very versatile and work well with most sauces including tomato and arrabiata (spicy). 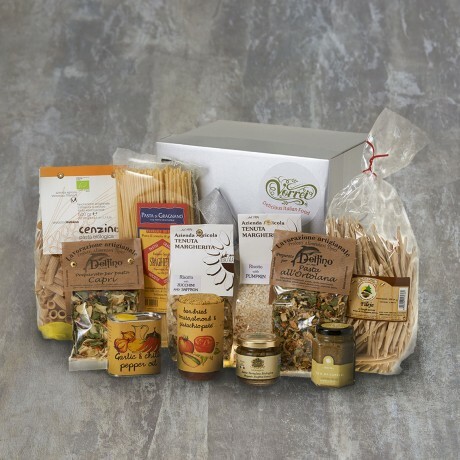 Hand Made Fusilli Pasta (500g) One of our favourite regional pasta shapes! These bronze die cut spirals go well with tomato based sauces and also pesto. Truffle Sauce (90g) Made with black summer truffle and best quality natural ingredients, this sauce will give a luxurious finish to any pasta dish. It pairs perfectly well with our penne pasta. Basil, Walnut & Green Pepper Pesto (212ml) A pesto with a difference! This nutty, slightly spicy pesto is delicious stirred into pasta or rice! Tomato Sauce with Red Tropea Onions (314ml) This is a hearty tomato based pasta sauce, hand made in Calabria with the famous sweet Tropea onions. Garlic and Chilli Pepper Oil (175ml) The perfect oil for adding to spaghetti to make garlic, oil and chilli pasta. We love it too in salad dressings and drizzled on a bruschetta. Amalfi Dried Pasta Sauce Mix (50g) Make a delicious pasta sauce in minutes with this handy mix, just add tomatoes and olive oil! Ready Made Risotto Mix with Porcini (250g) Our ready made mix makes it easy to make a real Italian risotto in just a few minutes. All you need to add is olive oil! Ready Made Risotto Mix with Truffles (250g) Made with superfine Carnaroli rice and truffles, this is a tasty and easy to prepare meal. Just follow the simple instructions.